Want a Free Prophypal Handpiece? See Page 38 For More Details! APRIL 25 | 8:00PM ET Dr. Christopher Phelps Get your team in the right seat on the bus! MEET OUR CLINICAL DIRECTOR! Dr. Lisa Germain, DDS, MScD serves as Clinical Director for DC Dental and has an active endodontic practice in New Orleans, LA. Dr. Germain’s unique combination of skills and experience make her a prominent, world expert in the differential diagnosis and treatment of odontogenic and non-odontogenic facial pain, dental materials, and treatment planning for optimum success. She lectures around the world at dental meetings and in university settings on a variety of dental topics, is a member of numerous dental organizations and is a contributing author for several dental publications. 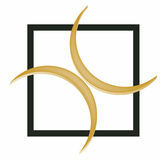 The DC Clinical course series is proudly brought to you by DC Dental. For more information, visit www.dcdentalclinical.com or call 877.947.8626. We handpicked some of the best promotions for the second quarter of 2019! Bringing you new and essential products for your dental practice! Dr. Lisa Germain presents the importance of having a checklist in every dental office. An easy reference to see everything on special this quarter! HeliPlug is a collagen plug wound dressing in a cylindrical shape that works best for extraction sites and biopsy sites. It is a soft, white pliable, non-friable, absorbent sponge made from collagen obtained from bovine deep flexor tendor which promotes tissue growth by providing a scaffold-like structure. HeliPlug is indicated for application to moist or bleed oral wounds created during dental surgery to control bleed and protect the surface of the wound from further injury. Absorbs within 10 to 14 days. DentaPure users the same proven technology developed for NASA to ensure that water is clean and purified in the dental unit. The cartridge reduces bacteria in dental unit waterlines to a level that meets or exceeds the standard set by the Environmental Protection Agency (EPA) and the recommendations put forth by the Centers for Disease Control (CDC) for safe drinking water. Once it is installed, there is no monitoring or shocking protocol required for the life of the cartridge. You will receive a friendly reminder when it is time for you to replace your cartridge. 813-3387_: 2/Pack Refill Maxcem Elite is a self-etch, self-adhesive resin cement for indirect restorations with enhanced bond strength, predictable handling and exceptional ease-of-use. With One-peel™ clean up technology, you are guaranteed easier cleanup each and every time. Maxcem Elite is compatible with all indirect restorations - anterior or posterior ceramics, PFMs and metal restorations and CAD/CAM materials. The optimized resin matrix and filler systems improve wetting ability, resulting in greater adhesion to dentin. 380-880__: 200/Box Crafted in Medicom’s state-of-the-art manufacturing facilities, SafeSeal Quattro pouches are mechanically sealed using TruePress™ Technology. This unique technology involves an exclusive production process that fuses the proprietary blue tinted film with high grade medical paper to form a perfect bond. The result is a leak resistant pouch that protects the integrity of your instruments every time. SafeSeal Quattro pouches gives you the assurance of confirming sterilization parameters in one easy step: time, temperature & steam with internal & external indicators printed directly on the pouch. All Medicom pouches provide peace of mind, convenience and economy. Properly stored, they maintain sterility of the instruments for up to 1 year post sterilization. WE HANDPICKED THE BEST PROMOTIONS FOR YOU! Soft White Nitrile Gloves are designed with patented HYDRASOFT™ Skin Moisturizing Technology which is proven to allow skin to retain two times more moisture than most gloves. These gloves will continue to replenish moisture to prevent dryness throughout your work day. The super soft, lightweight nitrile construction provides extra comfort and tactility while working. Oraqix, a combination of lidocaine and prilocaine, is uniquely combined with a patented, thermosetting system to delivery pain relief where it is needed without the use of a needle. It can be used for one or multiple teeth or even for full mouth scaling and root planing. In as little as 30 seconds, Oraqix provides sufficient anesthesia for approximately 20 minutes. Dentists and dental hygienists alike can be confident in choosing Oraqix because it is FDA-approved with a wellestablished safety profile. 317-21333_ LuzaCore Z Dual is DMG’s premium composite for core build-ups and post cementation, providing dentine-like cuttability to ensure a controlled and precise preparation of the margin. The ultra-strong, ultra-reliable core build-up material is now made with zirconia. Its combination of zirconia filler with DMG’s patented nanotechnology means it significantly improves strength, flowability and physical properties it’s the ultimate in resin technology! 424-90076__: 200/Box Enamel Pro Prophy Paste is the only prophy paste with ACP technology for 31% more fluoride uptake. We know that fluoride uptake is critical to strengthening tooth enamel and reversing the demineralization process. Enamel Pro provides an intense polish and shine to provide your patients with lustrous, whiter, and brighter teeth. In addition, the colorful swirl cups and great tasting flavors will keep your patients smiling. Q2 new I M P R E S S I O N S BRINGING YOU THE LATEST AND GREATEST PRODUCTS ON THE MARKET! 686-390_C: 10 frames, 20 lenses & 1 cord, Grey or Orange Lense Dynamic Disposables are a lightweight, disposable cost-effective alternative eye protection that reduces eye splash contamination incidents. Unlike traditional safety glasses that create pressure points on the nose and temples, these disposables wrap around the head for a secure, more comfortable fit. The reusable wraparound frame also includes a unique protective ridge that offers “top down” protection from splatter. The lenses feature self-closing holes to prevent gaps and meet the OSHA and Center for Disease Control’s Guidelines for protective eyewear. 428-64251_: 16/Pack Tips, $109.60 428-64252_: 2 x 1.8gm Syringes, $98.65 TPH Spectra® ST Flow Composite Restorative with SphereTEC® filler technology brings enhanced simplicity and versatility to traditional flowable indications. With the same Chameleon shade blending ability and shade system as universal composite, this flow has 5 universal CLOUD shades to cover the full 16-shade VITA range. TPH Spectra® ST Flow offers flow-on-demand-handling with versatility across all traditional flowable indications. You are guaranteed to have lasting esthetic results with this new product from Dentsply Sirona. 163-10116: 4gm Syringe OMINCHROMA is a groundbreaking technology that changes the art of shade matching. It gives you a single shade of composite that is clinically proven to match the color of any tooth. With exceptional color matching, high polishability and excellent physical-mechanical properties, OMINICHROMA is a win-win for all offices. new I M P R E S S I O N S Q2 BRINGING YOU THE LATEST AND GREATEST PRODUCTS ON THE MARKET! 579-691258BU: 100-240V, $1,524.65 579-691257BU: 100-240V & Radiometer, $1,759.60 Bluephase G4 is an intelligent LED curing light thanks to its Polyvision technology that helps clinician ensure a more effective polymerization of lightcured dental materials. Polyvision alerts the clinician if they move the curing light probe away from the tooth while curing and dynamically increases the curing time to compensate for the movement. Polyvision is like a vehicle’s lane departure warning system, which helps the clinician keep the curing light probe focused on the tooth for more effective polymerization of the dental material. Bluephase G4 also features Polywave technology, which provides a broad wavelength spectrum of 385-515nm, allowing the light to cure all dental materials on the market today. Vac Attack Green is specifically designed to deliver a safe, effective and environmentally-friendly evacuation system cleaner that is compliant with the EPA’s Clean Water Act. With a neutral pH and no oxidizing agents, Vac Attak Green meets the ADA’s best management practices. It is a non-foaming and non-corrosive enzymatic formulation that is safe and gentle for every day use with all amalgam separators. Filtek Universal Restorative makes your restorations, your composite, and your day, universally simpler. Filtek Universal Restorative has 8 designer shades with a universal opacity that meets most clinical needs. With NaturalMatch technology, this will allow you to match most of your patients’ dentition to blend more naturally. In addition, two of 3M’s top technologies, low-stress monomer and TRUE nanotechnology were combined to make the most advanced composite yet. As many of you know, I have lived and practiced in New Orleans, LA since 1984. When Hurricane Katrina hit the city on August 29, 2005, my family and I evacuated leaving our home, my dental practice, my husband’s law practice and my children’s school behind us with an uncertain ominous feeling of dread as we realized that life as we knew it was about to change forever. Within a matter of just a few hours, the city’s telephone lines, cell towers and electrical power went out – making high tech communication impossible. At much the same time, the levees protecting the city were breached. A lone agent of FEMA (Federal Emergency Management Agency) managed to get a helicopter ride over New Orleans that afternoon and reported seeing widespread flooding, hundreds of people stranded on rooftops and bodies floating in the water. He filed an urgent report by e-mail because all other means of communication had been lost. The only problem with that was FEMA’s top official didn’t use e-mail and therefore FEMA didn’t even know there was an emergency until TV pictures of the disaster were broadcast the following day. By then, 80 percent of the city was flooded, forty thousand refugees were stranded at the New Orleans Superdome and Convention Center, five thousand people were stranded on an overpass on Interstate 10, hospitals were without power and widespread looting had broken out as people became desperate for food and water. For days, the federal government, the state government and the local government then debated who should respond while the situation on the ground. Subsequently, when I read the book “Checklist Manifesto” by Atul Gwande, I couldn’t help but think that a simple checklist could have been used to prevent the breakdown in communication, minimize the loss of human life, and avoid the utter confusion about who was in charge at the time. Complex situations such as this arise in every industry all the time, however, the solutions are often complicated and demanding. When you factor in human error, you find that people become paralyzed dealing with complexities and tend to overlook what might be the more common sense and immediate solutions to some of the most basic and urgent problems at hand. comprehensive procedure manuals. They are tools that enable you to minimize errors of omission and keep you on task in the moment. They can prevent you from missing a step that is crucial to the outcome of your procedure. In addition, they can provide you with a method to provide a higher level of baseline performance for your team. If you have not joined our Facebook group, I want to invite you to join me there so we can discuss this further in our forum. I would like to know what you think about implementing checklists in your practice. I am going to open a discussion on our Facebook group page about them. Please let me know if you have any checklists that you would like to share with us. How have they have worked for you to improve your practice? Attached you will find a PDF which is a checklist to develop a checklist. I challenge you to use this simple method to create your first checklist and share it with our group! A CHECKLIST FOR CHECKLISTS DEVELOPMENT UU Do you have clear, concise objectives for your checklist? DRAFTING UU Are there fewer than 10 items per pause point? UU A critical safety step and in great danger of being missed? UU Not adequately checked by other mechanisms? UU Actionable, with a specific response required for each item? UU Designed to be read aloud as a verbal check? UU One that can be affected by the use of a checklist? HAVE YOU CONSIDERED: UU Adding items that will improve communication among team members? UU Involving all members of the team in the checklist creation process? DOES THE CHECKLIST: UU Utilize natural breaks in workflow (pause points)? UU Use simple sentence structure and basic language? UU Have a title that reflects its objectives? UU Have a simple, uncluttered, and logical format? UU Fit on one page? UU Minimize the use of color? VALIDATION UU Can the checklist be completed in a reasonably brief period of time? future review and revision of the checklist? HAVE YOU: UU Trialed the checklist with front line users (either in a real or simulated situation)? DOES THE CHECKLIST: UU Fit the flow of work? UU Detect errors at a time when they can still be corrected? UU Sans serif? UU Upper and lower case text? UU Large enough to be read easily? UU Dark on a light background? Dr. Lisa Germain, DDS, MScD serves as the Clinical Director for DC Dental and has an active endodontic practice in New Orleans, LA. Dr. Germain’s unique combination of skills and experience make her a prominent, world expert in the differential diagnosis and treatment of odontogenic and non-odontogenic facial pain, dental materials and treatment planning for optimum success. She lectures around the world at dental meetings and in university settings on a variety of dental topics, is a member of numerous dental organizations and is a contributing author for several dental publications. Ask your DC Dental representative for complete ordering information. *To obtain free goods, you can redeem by email. Proof of purchase on one DC Dental invoice dated April 1 – June 30, 2019 is required (multiple invoices are accepted from a single purchase order when order cannot ship complete). Redeem by July 31, 2019. Redeem by email: 3MOralCarePromos@mmm.com. Specify bonus product selections and include your business phone. Allow 3–5 weeks for delivery. Offers valid in the United States. Offer void if purchased product is returned. See current quarterly promotion flyer at 3M.com/Dental for additional details. 3M and Filtek are trademarks of 3M or 3M Deutschland GmbH. Used under license in Canada. © 3M 2019. All rights reserved. Buy 3 of the Same, Get 1 of the Same Free! Buy Any 4 Cases, Get 1 Case Free! Buy Any 3 – 50-ct, 100-ct or 1,000-ct Packs, Get 1 of the Same Free! *Bonus good of equal or lesser value of lowest price of purchased products. Ask your DC Dental representative for complete ordering information. To obtain bonus goods, you can redeem by email. Proof of purchase on one DC Dental invoice dated April 1 – June 30, 2019 is required (multiple invoices are accepted from a single purchase order when order cannot ship complete). Redeem by July 31, 2019. Redeem by email: 3MOralCarePromos@mmm.com. Specify free product selections and include your business phone. Allow 3–5 weeks for delivery. Offers valid in the United States. Offer void if purchased product is returned. See current quarterly promotion flyer at 3M.com/Dental for additional details. 3M, ESPE, Aplicap, Clinpro, Filtek, Garant, Impregum, Imprint, Maxicap, Penta, RelyX, Scotchbond and Vanish are trademarks of 3M or 3M Deutschland GmbH. Used under license in Canada. © 3M 2019. All rights reserved. Call Us: 800.221.3046 | Fax: 330.645.8704 | coltene.com *Promotion period is April 1, 2019 through June 30, 2019. Eligibility restricted to the United States and Canada (excludes US territories). May not be combined with any other COLTENE promotion. Please submit your rebate request before July 31, 2019, using the rebate form located at UC150.coltene.com and submit with proof of purchase to promotionspecial@coltene.com or fax to 330.645.8935. Promotion code UC15075 must be noted on invoices for redemption. Please allow 4-6 weeks for gift card processing. $273.80 141-DP365M For waterlines plumbed directly to city water Installs onto incoming lines with included fittings. $273.80 141-DP365B For independent water bottles Easily self-installed onto existing pickup tube with included fitting. BUY 9 BOXES,GET 1 BOX FREE! No mix and match. Luxatemp set the benchmark as the ultimate provisional material. Now, the best just got better with Luxatemp Ultra. Incorporating proprietary nanotechnology, Luxatemp Ultra contains industry leading flexural strength – the true measure of provisional stability and long-term durability. TempoCemID delivers standout performance by blending in. This esthetic-oriented, temporary cement is invisible under restorations, yet detectable for easy clean-up of excess; Invisible and Detectable (ID). Formulated for optimal transparency, TempoCemID will never impact the shade of your provisional, making it an ideal choice for both posterior and anterior restorations alike. *To receive free goods, please fax your paid DC Dental invoice to DMG America at 201-894-0213, or email to freegoods@dmg-america.com indicating type of free good. The most popular type will be shipped unless otherwise noted. Each qualifying purchase must be submitted on one invoice. Promotion cannot be combined with any other offer and may change or be discontinued at any time without notice. All offers must be redeemed within 30 days of purchase. Limit 5 offers per dental office. Promotions not available to dental supply dealers. Visit www.dmg-america.com or call 800.662.6383 for more information. One solution to clean and protect. Won’t leave a residue that can leave water spots. Sultan Healthcare is now Dentsply Sirona. Same great product. New Look Coming Soon! Adjustable Camera Sleeve Quickly and easily achieve a tight, custom-fit on virtually any size camera head! The only sleeve you’ll ever need! Quick and easy! Your image is always crystal clear and sharp! Cavitron® Inserts For hygienists who strive for efficiency, comfort, and performance, Cavitron® family of inserts work together to deliver the highest standard in ultrasonic scaling. A comprehensive line of ultrasonic scaling inserts designed to best serve you, your patients, and your practice. Buy 3 Cavitron® Inserts, Get 1 FREE! Buy 5 Cavitron® Inserts, Get 2 FREE! Buy 1 Cavitron® Steri-Mate 360 Handpiece 30K (3-pack), Get 1 Cavitron® Steri-Mate 360 Handpiece 30K (1-pack) FREE! There’s only one Cavitron®. For more information or to request a demo, call 1.800.989.8826. PROGRAM RULES: Free goods must be of equal or lesser value than least expensive product purchased. Purchase must be made from DC Dental between 4/1/19 and 6/30/19. Invoices must be received no later than 7/31/19 to claim free goods. Purchase must be made on ONE (1) invoice. To receive your free goods, submit invoice noting promotional code(s) AND FREE GOODS REQUESTED by scanning the invoice and emailing it to dpdredemptions@dentsply.com or fax invoice to 1-800-278-4344. Incomplete submissions will not be processed. Limit 5 redemptions per Doctor. These offers may not be combined with any other Dentsply Sirona offers or contract agreements. Free goods fulfilled through Dentsply Sirona. Allow 4-6 weeks for delivery. Offers valid in the 50 United States only. Data on file. PLUS a full line of specialty inserts for perio surgical procedures, implant maintenance, and stain removal. The universal adhesive that’s more than strong. Midwest Once® Sterile Carbide Burs Pre-sterilized convenience now available for carbide burs. Comprehensive selection. Popular shapes 25 per pack, specialty shapes 10 per pack. Mix ’n’ match permitted. Free goods of equal or lesser value. *PROGRAM RULES: Free goods must be of equal or lesser value than least expensive product purchased. Purchase must be made from DC Dental between 4/1/19 and 6/30/19. Purchase must be made on ONE (1) invoice. To receive your free goods, submit invoice noting promo code MN901 and FREE GOODS REQUESTED by scanning the invoice and emailing it to MidwestFG@dentsply.com or fax invoice to 1-847-640-4801. Invoice must be received no later than 7/31/19 to claim free goods. Incomplete submissions will not be processed. Limit 5 redemptions per doctor. Offer may not be combined with any other Dentsply Sirona offers or contract agreements. Free goods fulfilled through Dentsply Sirona. Allow 4–6 weeks for delivery. Offer valid in the 50 United States only. GC Fuji® Automix LC Set Re ill: $139.90 (Net: $104.93) Contains: One cartridge (14.9 g) and 20 Automix Tips. 677-012712 Shade A1 677-012713 Shade A2 677-012714 Shade A3 GC Fuji® Automix LC Starter Kit Re ill: $218.30 (Net: $163.73) Contains: One GC Fuji® Automix LC Set, 1 Paste Pak Dispenser II and 1 CAVITY CONDITIONER (5.7 mL). 677-444001 Shade A1 677-444002 Shade A2 677-444003 Shade A3 800.323.7063 • www.gcamerica.com • www.gcamerica.com/training • © 2019 GC America Inc.
*Promo 2289. To receive your free goods, send a copy of your DC Dental invoice dated 4/1/19 – 6/30/19 to GC America, 3737 West 127th Street, Alsip, IL 60803 or fax to 800.423.2963 Attn: Customer Care Group. Must be redeemed within 6 weeks of dealer invoice date. Offers cannot be combined with any other offers or promotions. No substitutions allowed. Offers are valid in the US only. Free goods will be of equal or lesser value to the lowest selling unit price. Please allow 6-8 weeks for free goods delivery. Free goods will be fulfilled by GC America unless noted otherwise. All promos expire 6/30/19. 800.323.7063 • www.gcamerica.com • www.gcamerica.com/training • © 2019 GC America Inc.
**Promo 2294. To receive your free goods, send a copy of your DC Dental invoice dated 4/1/19 – 6/30/19 to GC America, 3737 West 127th Street, Alsip, IL 60803 or fax to 800.423.2963 Attn: Customer Care Group. Must be redeemed within 6 weeks of dealer invoice date. Offers cannot be combined with any other offers or promotions. No substitutions allowed. Offers are valid in the US only. Free goods will be of equal or lesser value to the lowest selling unit price. Please allow 6-8 weeks for free goods delivery. Free goods will be fulfilled by GC America unless noted otherwise. All promos expire 6/30/19. With the most extensive selection of hand instruments in the dental industry, Hu-Friedy is your partner in delivering the best clinical outcomes for your patients. Now available in UNC12 markings! Qualifying purchases must appear on a single dealer invoice and must be made between 4/1/19 - 6/30/19 Request for Free Goods must be received no later than 7/31/19. Go to our “NEW” Free Goods Redemption Portal to upload your invoices. 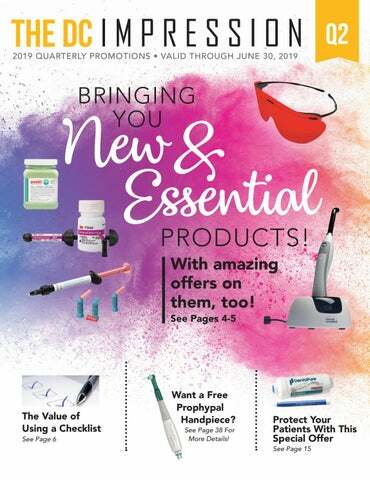 www.freegoods.ivoclarvivadentusa.com Or FAX to 800-598-4569, EMAIL to usclinical@ivoclarvivadent.com Ivoclar Vivadent reserves the right to modify or cancel these promotions at any time. These specials cannot be combined with any other offer or rebate program. ©2019 Ivoclar Vivadent inc, Ivoclar Vivadent, Variolink, Adhese, Vivapen, Tetric, IPS e.max and Cervitec are trademarks of Ivoclar Vivadent, Inc.
You know what it takes to make your restoration undetectable. Introducing Harmonize™—the next generation composite infused with Adaptive Response Technology™. kavokerr.com | 866-KAVO-KERR ©2019 Kerr Dental. All rights reserved. Apply SonicFill™ 3 and sculpt. 1 There is no step two. These offers cannot be combined with any other promotion or discount. Other restrictions may apply. Customer will be invoiced for purchased goods from DC Dental and no charge goods will ship with the same order. Promo is valid from 03/15/19—06/30/19. Not responsible for typographical errors. Venus® Pearl and Venus Diamond® One proven chemistry — three unique viscosities. The Venus Family of Composites sets a new standard of care with an unprecedented combination of superior handling, low shrinkage stress, and high flexural strength. Call for a free sample: 516.246.2743 *Free sample available. Now with easy-open flip-top lid for one-handed operation. With intermediate level DisCide Ultra, surface disinfectant and decontaminant cleaner, you can accelerate the way you disinfect clinical settings. In just 60 seconds, DisCide Ultra is effective against TB, viruses (HBV, HCV, RSV, HIV-1), bacteria (MRSA, VRE, E. coli), and fungi (C. albicans). DisCide to be sure with fast acting DisCide Ultra. Keeping your evacuation line clean is an important part of keeping your HVE and saliva ejector running smoothly. Vacuum Shock and Vacuum Clean are an easy two-step system that keeps high/low speed lines clean and fresh. When used in conjunction, the time-release formulation ensures your line is protected around the clock. Don’t let a compromised evacuation system make problems for your practice, use the one-two punch that keeps evacuation lines happy. Visit discide.com for a disinfectant efficacy chart. * To receive your no charge item(s), please email a copy of your DC Dental invoice dated 04/01/19-06/30/19 to: customerservice@palmerohealth.com, fax to (203) 377-8988, or mail to: 120 Goodwin Place, Stratford, CT 06615. Must receive invoice by 07/31/19. Please allow 18-0069_Dealer_Flyer_Ad_8.375x5.5.pdf 1 10/26/18 10:28 AM 4–6 weeks for no charge goods. Offer only available for continental U.S. Better for your patients. Better for you. Sonic® Our Newest Nitrile – 2.2mil Powder Free Indigo Exam Gloves [985-93775] XS [985-93776] S [985-93777] M [985-93778] L [985-93779] XL $18.50 Nets to $14.80 after free goods. Nets to $4.93 per 100 gloves. [985-92899] XL $7.85 Nets to $6.28 after free goods. Bold® Durable Black Nitrile – 5.0 mil Powder Free Exam Gloves [985-73995] XS [985-73996] S [985-73997] M [985-73998] L [985-73999] XL $8.75 Nets to $7.00 after free goods. $20.20 Nets to $16.16 after free goods. Nets to $5.39 per 100 gloves. Refresh® Popular Mint Scented Powder Free Green Latex Exam Gloves [985-99225] XS [985-99226] S [985-99227] M [985-99228] L $10.35 Nets to $8.28 after free goods. t and quality you need to get the job done. [985-92397] M [985-92398] L [985-92399] XL $14.30 Nets to $11.44 after free goods. Nets to $5.72 per 100 gloves. Blush® Strength Without Sacrificing Sensitivity – 2.5mil Powder Free Blush Exam Gloves [985-78885] XS [985-78886] S [985-78887] M [985-78888] L $15.70 Nets to $12.56 after free goods. Nets to $6.28 per 100 gloves. Distinct® Patented Honey Comb Texture Powder Free Latex Exam Gloves [985-29225] XS [985-29226] S [985-29227] M [985-29228] L [985-29229] XL $9.80 Nets to $7.84 after free goods. • Exceptional accuracy. • Choice of setting speeds: 30 seconds, 60 seconds and 2 minutes. • Plaster-like hardness (90-durometer). • Dependable, no-slump consistency. • Gel consistency allows accurate placement and no running. • Easy, no mess dispensing. • Unique tripolymer formula for effective, long-term results. Two 50ml cartridges (100ml ttl.) and mixing tips. Stock No. Three 3ml syringes and 30 needle nose intraoral applicator tips. Stock No. Embrace Prevention in every generation Premixed varnish ensures uniform dose and delivers 10 times more fluoride than the leading brand in 4 hours. PULPDENT ® Corporation 80 Oakland St. Watertown, MA 02472 T: (617)926-6666 /F: (617) 926-6262/ sales@pulpdent.com/ www.pulpdent.com To redeem free goods, fax, mail or email your invoice to Pulpdent by 4/30/19 with proof of purchase from 4/1/19 to 6/30/19. Special offer purchases must appear on one invoice to be eligible. Offers valid in U.S. ONLY. Please allow 6-8 weeks for receipt of free goods. YOUR SMART SOLUTION. Use in conjunction with our Riva Self Cure glass ionomer to provide superior strength and esthetics. * To receive free goods, email a copy of your DC Dental invoice to freegoods@younginnovations.com. Email is the preferred method of delivery, but you may also send a copy to: Young Innovations, 2260 Wendt St., Algonquin, IL 60102, or fax 888.771.7573. Offer(s) valid 4/1/2019 - 6/30/2019. Invoice must be received by 7/31/2019. Please allow 6-8 weeks for free goods. Qualifying purchase(s) must be on one invoice. Not valid in conjunction with any other offer(s). Questions? Please call 866.753.4392 or email youngdentalfulfillment@ydnt.com. Free goods offer(s) subject to change. applicable, indicate choice product on invoice. If no to: indication is made, available product will be sent atILour discretion. * To receive free goods, email a copy of your DC Dental invoice to freegoods@younginnovations.com. Email Where is the preferred method of your delivery, butof you may also send a copy Young Innovations, 2260 Wendt St., Algonquin, 60102, or fax 888.771.7573. Offer(s) valid 4/1/2019 - 6/30/2019. Invoice must be received by 7/31/2019. Please allow 6-8 weeks for free goods. Qualifying purchase(s) must be on one invoice. Not valid in conjunction with any other offer(s). Questions? Please call 866.753.4392 or email youngdentalfulfillment@ydnt.com. Free goods offer(s) subject to change. Where applicable, indicate your choice of product on invoice. If no indication is made, available product will be sent at our discretion. SIMPLE. SAFE. SECURE. Effortless compliance in a pre-folded, self-sealing flap. * To receive promotional goods, email a copy of your DC Dental invoice to fulfillmentfax@younginnovations.com. Email is the preferred method of delivery, but you may also mail a copy to: Young Innovations, 2260 Wendt St., Algonquin, IL 60102, or fax 888.771.7573. Offer(s) valid 04/01/2019 - 06/30/2019. Invoice must be received by 07/31/2019. Please allow 6-8 weeks for delivery. Qualifying purchase(s) must be on one invoice. Not valid in conjunction with any other offer(s). Questions? Please call 866.753.4392. Promotional offer(s) subject to change. Where applicable, indicate your choice of product on invoice. If no indication is made, available product will be sent at our discretion. 424-9007089 Unit Dose Dispenser (3) . . . . . . . . . . . . . . . . . . . . . . . . . . .
424-9007093 Traxodent Starter Pack (7 syringes and 15 tips) . . . .
424-9007091 Traxodent Value Pack (25 syringes and 50 tips) . . . . $254.95 424-9007092 Applicator Tips (50) . . . . . . . . . . . . . . . . . . . . . . . . . . . . . . . .
On PremierAir Instruments! * (Free instrument must be of equal or lesser value). * To receive your no charge merchandise, forward a copy of your DC DENTAL invoice indicating appropriate purchase(s) to Premier Redemption Center, P .O . Box 640, Plymouth Meeting, PA 19462-0640 . FAX number - 610-239-6171 . Email: Redemptions@premierdentalco .com . Offers valid in U .S . only . Indicate no charge goods of equal or lesser value . Offer valid 4/1/19 through 6/30/19 unless otherwise indicated . Redeem by 7/15/19 . Subject to change or cancellation without notice . Premier reserves the right to substitute no charge goods . May not be combined with other offers . / 1 . SDM Data 2017 . / 2 . Data on file . BECAUSE INFECTION RISKS ARE EVERYWHERE, SO ARE WE. Integrated Solutions to Help Fight HAIs. PDI covers your Interventional Care, Patient Care, and Environment of Care needs with effective infection prevention products, educational tools, and clinical support, all designed to get patients back home where they belong. Contact your DC Dental rep at (877) 653–7500 or visit dcdental.com to receive a free sample†. *Available in additional formats and sizes. †Free sample will be (1) Large Canister. Limit (1) sample per person. Offer expires 12-31-19. T Light Handle Sleeves • Slides over T Light Handle quickly and easily. • Unique design provides a neat fit on handle. • Reduces the possibility of cross contamination. 2019 Q U I C K G U I D E Not responsible for any errors. Please call for promotional details and redemption information. Buy 1 & 1 Primer, Get 1 Sofreliner Tough Paste Free! Buy 2 Get 1 Free or 10:1 Dispensing Gun Free! Buy 1 Get Canister (141-AMLSYRC) Free! Buy 10 Get 1 of the Same Free! Buy 1 Get 1 R.T.R Membrane (S0510) Free! Buy 4 Get 1 Free or Buy 30 Get 15 Free! Buy 6 packs Get 2 packs Free! Buy 5 packs Get 2 pks Free! Buy 5 Get 2 Free! Buy 10 Get 5 Free or Buy 25 Get 12 Free! Buy 10 Get 3 Free or Buy 20 Get 8 Free or Buy 30 Get 15 Free! Buy 3 Get 1 Tuff-Temp Plus 5ml Syringe Free! Buy 2 Get 1 Implant Scaler 2/Pk Free! Buy 1 Get 1 Implant Scaler 2/Pk Free! Buy 3 Get 1 Free or Buy 3 Get 1 Cerasmart or Initial LRF Block Free! Buy 4 Get 1 Adhese Universal Kit Free! Buy 3 Get 1 of the Same Free! Buy 8 Get 4 Free! Buy 2 Pefecta 16% and 21% Carbamide Peroxide 50 Paks Get 1 Free! Buy 4 Get 1 Variolink Esthetic refill or 1 Tetric Evo Line Refill Free! Buy 12 Get 5 ES-2 Classic Refills Free! Buy 2 Get 1 Clearfil Universal BOnd Quick Free! Existing Users: Buy 2 Get 1 Free! New Users: Buy 1 Get 1 Free! Buy 4 Get 1 Free or Get 2 Restorative Dispensers Free! "317-220750, 220751, 220752, 220753, 220754, 220755, 220756, 220757, 220758"
Buy 3 Get 1 Luxatemp Ultra Automix Refill Free! Buy 2 Scupltable Refills Get 1 Flowable Refill Free! Buy 4 Get 1 of the Same Free! Buy 4 Get 1 and 1 Clearfil Universal Bond Quick Bottle Intro Free! Buy 1 Get 1 Multi-Cal 3ml Free! Buy 2 Get 1 Multi-use Dispenser Free! Buy 8 Get 2 Super-Snap X-Treme KitsFree! Buy 2 and 1 MI Paste One Get 1 MI Varnish Free! Buy 1 Get 1 Activa BioActive Single Refill Free! Buy 7 Get 4 Free! Buy 10 Get 5 packs of the same Free! Buy 25 Packs Get 2 Packs Free! Buy 50 Packs Get 6 Packs Free! Buy 1 Get 1-5 PK Free! Buy 1 Get 3 Boxes Of Septoject Long Needles Free! Buy 3 Get 1 Comfit Plush Masks and 1 Purevac Auto Walkabout Dispenser Free! Buy 1 x 12/pack Get 1 x 3/pack Free! Buy 3 Get 1 Purevac SC Evaucation Cleaner, 2L Bottle and Purevac Auto Walkabout Dispenser Free! Buy 2 Get 2 VibraKleen 80 Count Tablets Free! Buy 2 Kits Get 1 VibraKleen E 80 Count Tablets Free! Buy 1 Get 5 PINK Gingiva Syringes Free! Buy 3-12 pks Get 1 Beautifil II LS A2 Syringe Free! Buy 1 Get 1 Beautifil II LS A2 Syringe Free! Buy 1 Get 1 Attachment Free! Buy 1 Get a TwinPower Handpiece Free and 4 Maintenance Couplers Free! Buy 3 Get 1 Coupler Free! Buy 1 Get a CP4-LD LED Coupler Free! Buy 6 Get a Lubrina Handpiece Maintenance System Free! Buy 9 Get a Lubrina and 4 Maintenance Couplers Free! Buy 4 Get 1 Free! Buy 3 Get 1 Free! Buy 1 Get $150 Rebate! Buy 4 Get 1 Posterior NEO Trays (424-2201NT) Free! Buy 3 Get 1 Traxodent Unit Dose Package Free! Buy 1 Get 1 (250-ct) Free! Buy 2 Get 1 Free or Buy 1 Case Get 3 Bags Free! Buy 3 Get 1 ProSoak Tray Free! Buy 14 Get 2 Free or Buy 20 Get 4 Free! Buy 1 Get 1 BirexSE 4-pk Intro Kit Free! Buy 1 Get 2 canisters of Birex Quat Disinfectanat Wipes Free! Buy 2 Get 1 Gallon Free! Buy 2 Get 1 Canister Opti-cide3 Wipes Free! Buy 12 Get 2 Canisters Opti-cide3 Wipes Free! Buy 6 Get 4 Free! Buy 6 Bottles Get 2 Free! Buy 1 Get $75 Rebate! Buy 3 Get 1 Waterline Filter or 1 Vista tab Cleaner Tablet Free! Buy 12 Get 2 Free or Buy 24 Get 5 Free or Buy 100 Get 25 Free! Buy 5 Get 1 Pair of Black Line Scissors Free! Buy 4 Get 1 Free or Buy 12 Get 4 Free! Buy 1 Get A Scotch Brite Free! Buy 1 Receive $250 in Free Goods! Buy 12 Get 4 Free or Buy 20 Get 8 Free! Buy any 3 Get 1 of the Same Free! Buy 1 Get 1 x 35/Pk Free! Buy 10 Get 5 Free! Buy 3 Get 1 Free! Buy 2 Get 1 Free! Buy 1 Get 1 Clearshield Varnish 35pk Free! Buy 2 get 1 free Rincinol 1771PA Free! Buy 2 get 1 free Variety Box 3615A Free! Buy 2 get 1 free Advanced 650PA Free! Buy 1 Get 1 Bag of 2Pro Angles (144) Free! Buy 2 Get 1 PremierAir Scaler Free! Buy 2 Get 1 of the Same Free! Buy 3 Get 1 ProphyPal Handpiece Free! Buy 1 Get a 1-125ct Box Free! Buy 2 Get 1 Everedge 2.0 Scaler/ Curettle Free! Buy 1 Get 5 Everedge 2.0 Scalers/ Curettes Free! Buy 1 Get 144/Pk Free! Buy 1 Get 1 x 144/Pk Free! Buy 1 Get 1-200ct box Free! Buy 1 Get 1 - 200ct box Free! Buy 4 Get 1 Free! Buy 2 Get 1 - 125ct box Free! Buy 2 Get 1 Box of Zooby Prophy Paste Free! Buy 3 Get 1 Box of Tastytooth Fluoride Varnish Free! Buy 4 Get 1 Assorted 50ct box of D-Lish Varnish Free! Buy 4 Get 1-50ct Zooby Varnish Free! Buy 10 Get 1 Bag of 100 Fortis Prophy Angles Free! Buy 1 30K Steri-Mate 360 HP 3-pack, Get 360 HP 1-pack FREE! Buy 4 Cavitron® Inserts, Trade 4 Inserts, Get 2 Cavitron® Inserts FREE! Buy 1 Get a Jumbo 50ml Etch Free! Buy 3 Get 1 Free or Buy 6 Get 3 Free! Buy 1 Get 5 Inserts Free! Buy 4 Cases Get 1 Case Free! Buy 2 Cases Get 1 of Same Free! Buy 2 Cases (12ct) Get 1 Case Free! Buy 6 Get 3 Free or Buy 3 Get 1 Free! Buy 1 Receive $500 in Free Goods! Buy 2 Get 1 Bag of Ultra-Thin Sycamore Wood Wedges Free! Buy 1 Get $100 Rebate! Buy 1 Get 2 -12/pk Pro-Form Laminates Free! Buy 1 Cavitron® 300 Series Package, Get a $400 rebate! Buy 1 Cavitron® 300 Series unit, Get a $300 rebate! Buy 1 Cavitron® Jet Plus Package, Get a $400 rebate! Buy 1 Cavitron® Plus Package, Get a $200 rebate! Buy 1 Cavitron® Prophy-Jet® Package, Get a $300 rebate! Buy 1 Cavitron® Select™ SPS™ Package, Get a $100 rebate! Buy 1 Get Free Insert! Buy 1 Get 2 Inserts Free! Buy 4 Pks Get 1 Pk Free! Buy 3 Get 3 Medium Bullets Free! Buy 3 get 1 Paroex 1789P Free! Buy 2 Get XCP-DS Fit Free! Buy 2 Get 1 Uni-Grip® Positioning Arm and Ring Free! Buy 2 Get 1 RTR Membrane Free! Buy 2 Get $100 Rebate! Buy 2 Get 1 Refill Kit Free! Buy 1 Get 1 Uni-Grip® Positioning Arm and Ring Free!